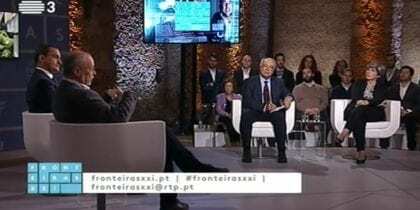 On the past Thursday, 15th of March 2017, basic income was discussed for the first time on a prime-time television program in Portugal, through the recently created channel RTP3. The program, which ran for 1hr 30 min, was framed as a group interview and debate, moderated by journalist Carlos Daniel. The program included some related reporting and excerpts from other interviews. Four participants made up the panel, and the main theme of the discussion was automation and its societal consequences. Manuela Veloso, a robotics researcher in the United States and head the Machine Learning department of the Carnegie Mellon University, was one of the panelists. Asked if automation will be good or bad, she first pointed out its inevitability. Machines are capable of capturing much more data than human minds cannot possibly manage to cope with in order to make decisions: people will have to rely on machines for support in decision making. She also argued that although machines will naturally replace some human work, other human tasks will be created with the increasing use of automation in industry and services. Another participant was Carvalho da Silva, a lifetime syndicalist and researcher in sociology. Carvalho da Silva pointed out certain caveats when facing what many are calling a “technological revolution”. He said that we should not be deterministic about it (casting doubts about its impact on jobs), since ultimately decisions are political. He underlined that the entire situation must be contextualized and inserted into a crisis framework, where many more jobs have been lost than those estimated to be lost to automation. Like Manuela, he also highlighted the job creation potential of these new technologies. António Moniz, a sociologist specializing in work and enterprises, and a researcher on the impact of automation in society was also invited. António pointed out that machines are demanding higher professional standards from people tasked to handle them. He relativized the question of job destruction due to automation, believing that there is no direct relationship between introduction of machinery and loss of jobs (although the numbers shown during the program clearly depicted elimination of jobs in large swathes due to automation). Finally, João Paulo Oliveira, an executive manager of a large paper production company in Portugal, was also present. He alerted the audience to the fact that the adoption of automation is extremely fast these days, so that all politicians must be made aware of its effects on society. According to him, an important aspect of this transformation is education, which must be more in tune with demand. According to him, the marketplace will determine what the “jobs of the future” will be, and the education system must follow suit. The program included short pieces and interviews, inserted between presentations by the panel. One of those segments was with Gabriele Bischoff, a long time syndicalist and president of the Workers’ Group of the European Economic and Social Committee. Shocked to learn that a company in Belgium already uses chip implants in its employees, she highlighted the importance of respecting workers’ fundamental rights and the need to provide them – especially young workers – with good quality, stable jobs, which can give them, dignified life standards. Another segment featured Guy Standing, a lifetime researcher of economic and social issues; a professor and activist defending the basic income concept. He summarized the basic income principle and, when questioned as to how the Portuguese people can finance it, he clearly stated that “It’s a matter of fiscal priorities”. According to him, if, for example, such regressive practices as the systematic saving of banks in the past decade were eliminated and the money used for the benefit of all citizens, a basic income could have been already administered in Portugal. Standing also predicted that within the next five years some country will implement the basic income concept, which will lead other countries to gradually follow suit. During the program, simple graphics were shown, both for briefly explaining what basic income is and to report on the estimated number of jobs likely to be lost (and gained) to automation in the next 15 years. Notably, the next Basic Income Earth Network (BIEN) Congress, happening in Lisbon on September this year, was also cited. The conversation about the future of work naturally led into a debate about basic income. Each of the participants was directly asked what they thought about the idea and its anticipated consequences. Maria Veloso was quick to support it, although questioning its feasibility. She regards the idea as a freedom gaining instrument, in an age of relentless automation and ever-expanding learning opportunities. She also referred to its role as a secure financial platform that allows people to engage in activities not bound by economic viability, in such a way that work is aligned with what each person wants to do in life. Clearly against was Carvalho da Silva, despite his past as a syndicalist. According to him, basic income is against the work ethic, and he assumes that people will lose their motivation to work under that regime, hence also losing a great deal of their meaning in life. He also thinks that basic income is the perfect instrument for the far right political branch to push in neo-liberal agendas slashing the welfare state. On the other hand, António Moniz was more cautious, supporting the basic income idea in general but warning that its effects on the marketplace and especially on companies must be well understood. 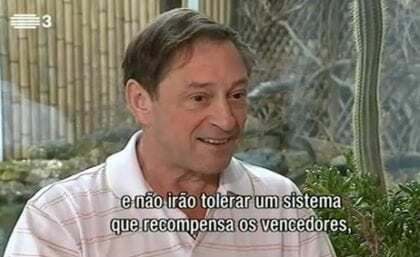 João Paulo Oliveira was not convinced by the basic income concept or its rationale, as presented by Guy Standing or his fellow panelists. According to him, basic income will just kill competitiveness as more and more people move away from work. Sempre a tentar aproveitar todas as oportunidades para promover a ideia do UBI, mesmo que nem saibam bem a que é que se refere, nem tenham planos definidos para a sua implementação. Seria posto em ação para suportar pessoas incapazes de serem reinseridas no mercado de trabalho, perante a eliminação de determinados postos de trabalho, ou apenas para suportar quem continuasse a procurar ativamente trabalho, e portanto para quem fosse viável encontrá-lo? Substituiria todas as outras benesses sociais, ou seria acrescentado a elas? Como seria calculado? No cálculo seria contabilizado o quê como necessidades básicas? Ninguém responde a estas questões convenientemente, e depois andam para aí a fazer propaganda por algo que nem sequer sabem ao certo se e como funcionaria. – O valor atribuído nesse estudo parte dos rendimentos, e não do levantamento das necessidades básicas. No entanto, o valor calculado está próximo do limiar da pobreza definido para Portugal. O artigo aqui publicado não é “propaganda”, mas apenas a referência a um programa de televisão em que se discutiu o conceito. Em todo o caso, há estudos realizados, como poderá constatar no link acima. Se não concordar e/ou achar que está incompleto, faça o favor de o complementar ou substituir por outro da sua autoria.